Syneron Medical is among the most respected brands of aesthetic medical devices, and the Syneron Aurora is one of the company’s most significant contributions to intense pulsed light technology, or IPL. Aurora is an enhanced IPL device. Powered by ELOS, Syneron’s proprietary electro-optical synergy technology, the versatile Aurora delivers both IPL and bi-polar radio frequency. Syneron’s founder, Dr. Shimon Eckhouse, invented IPL technology. Colleagues honor Dr, Eckhouse as a revolutionary figure in the field of non-invasive aesthetic procedures. Countless professionals rely on IPL to treat skin conditions such as birthmarks, port-wine stains, fine lines, wrinkles and spider veins. IPL also reduces cellulite and removes unwanted hair. The Syneron Aurora has enjoyed a sustained reputation for safe, long-lasting hair removal treatments. Aurora’s ELOS methodology impairs hair follicles. Successive treatments render the follicles too compromised to support the normal process of hair growth. The results are long-lived and often permanent. Physicians consider Aurora treatments superior to traditional waxing and electrolysis. The Aurora is easily configurable for specific applications. The operator simply changes the heads. 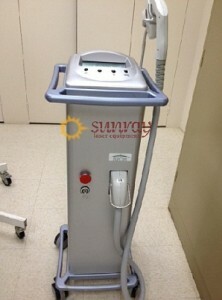 Syneron gears the Aurora DS for hair removal and the Aurora SR for skin rejuvenation therapy. The Aurora SR/DS head covers both treatments. SunrayLaser.com is pleased to carry products manufactured by Syneron Medical, a pioneer in the field of intense pulsed light technology. Patients throughout the United States recognize the Syneron brand, thanks to numerous feature spots on television news medical segments and the “Today Show,” in addition to articles in popular magazines such as Essence, Allure and Harper’s Bazaar. Certified medical device technicians working with SunrayLaser.com meticulously test and recondition each Syneron Aurora unit we offer for sale. Your refurbished machine will conform to the safety and operational standards specified by the manufacturer. Let’s discuss how the Syneron Aurora system can enhance your practice. Please contact us via the form below. A trained laser consultant will contact you as quickly as possible. We are always happy to quote a low web special price on the Syneron Aurora or any other item in our inventory.